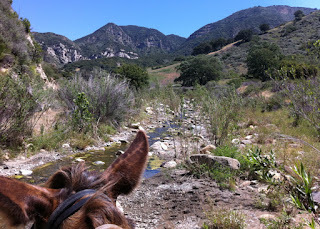 A ride from Rancho Oso on Paradise Road, across the Santa Ynez River to the Aliso Canyon Trail, then back around through the canyon past the Upper and Lower Oso campgrounds, in the front country range of the Los Padres Forest in Southern California. Difficulty: Strenuous. 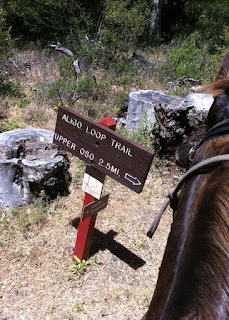 Steep drop offs and loose shale areas on the canyon sides, narrow single track trail with very steep ascents and descents. On a lovely day in May I was invited to go for a trail ride in the Santa Ynez Mountains by a visiting equestrian from Palos Verdes Estates. She has camped in the area a lot, and was eager to have a companion for a trail I had not yet gone on, so I was pleased to say yes! We started out at Rancho Oso, and walked down towards the river, past the big field where one of the longhorn cows gave Tobe the stinkeye. 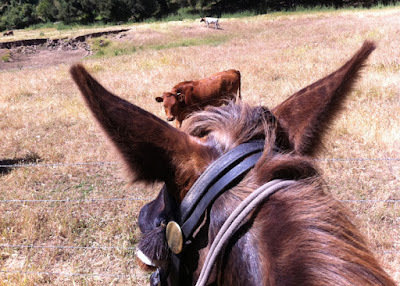 Tobe is a Kentucky Mule, so even these rather impressive Texas longhorns ain't no big thing to him. 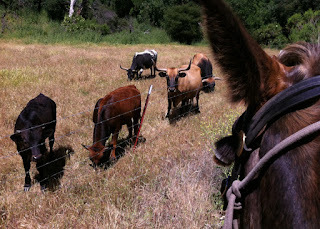 And besides, THEY have to stay in their barbed-wire fenced area, while he and I were off to an adventure! Nobody is roping US! Off and away, up into the hills for a challenging trail ride on a very beautiful Spring day. Wildflowers in bloom everywhere, and the stream full of tadpoles. 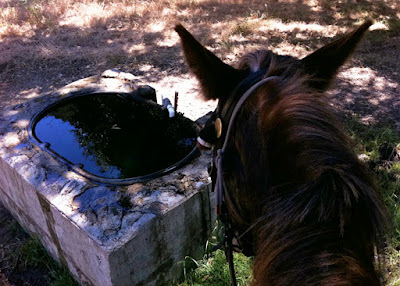 At the Upper Oso Campground there is a water trough for mules and horses, a very welcome sight for the thirsty steeds. 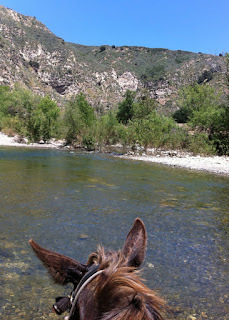 Right now there is water everywhere for them to drink in the river, but on summer rides this trough is very important. 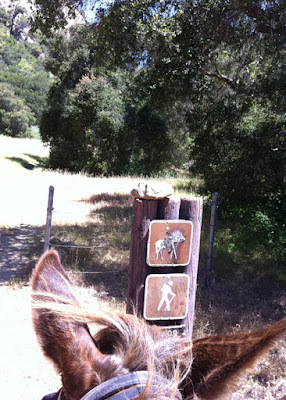 At the top of the Upper Oso Campground the equestrian part of the trail sign has been seriously defaced. What's up with THAT ? This part of the Aliso trail was completely washed out in April, and when we reported it to the Forest Service they told us that because of a lawsuit brought by Forest Watch, a local "environmental group," there was an injunction stopping the Forest Service from repairing it. But the camp host at Upper Oso told us that little elves had come magically in the night and the trail has been repaired! The chasm has been filled in, and a new trail carved up above the part that fell away, shown here on the right. Quite professionally done. Thanks elves! We climbed up above the Upper Oso campground, completely deserted at present because the river is so high that cars can't get back there So no campers, just hikers and equestrians. We ran across a few healthy people with their dogs, all of us out experiencing the primordial California landscape that looks just like it always has. and I just could NOT take any pictures. 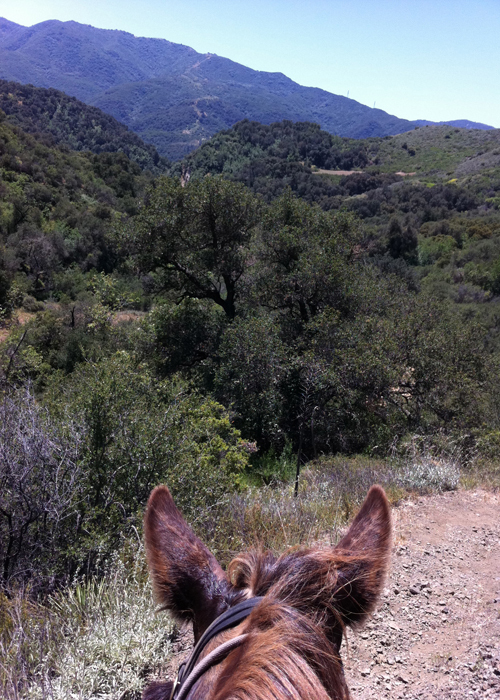 I give all confidence and faith to the hoof power of my marvelous mule, but some parts of that trail were only 2' wide and made of shale, teased out of a sheer mountainside, and I did not have any place I felt like I wanted to ask Tobe to interrupt his momentum and let me play tourist with iPhone snapping pictures. We kept going! I am committed to the idea of Tobe and I becoming a centaur on the trail, and he being a mule I negotiate as much as I can. 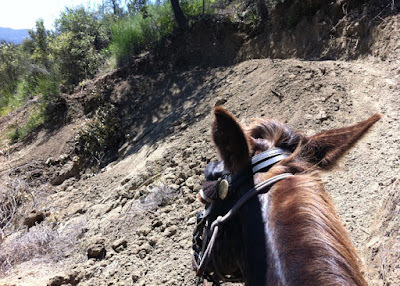 On a trail like that canyon I concentrate on keeping my balance steady, and letting him take care of getting us safely through. 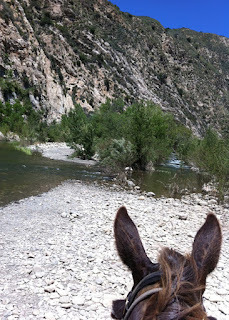 He is as sure footed as his race is known for, so on those sheer canyon walls I just kept a positive thought and let him get me where we wanted to go. And eventually found ourselves in a beautiful part of the river, wide and still very deep, completely empty and silent except for the melodious sounds of hawks and songbirds. Some places were deep enough to swim, but we left that for another day. 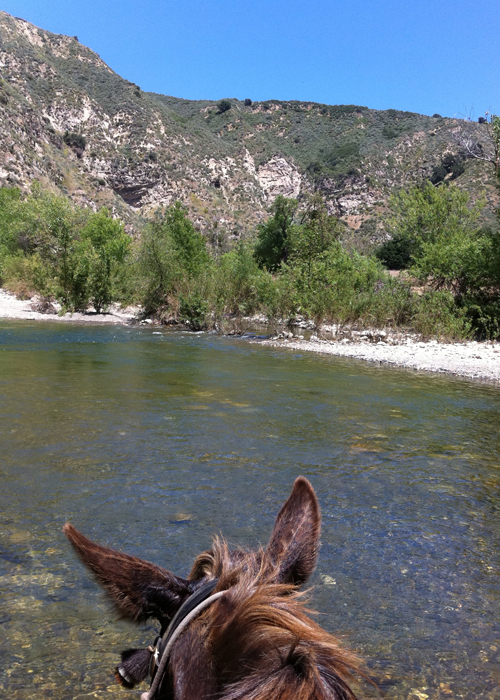 Afterwards Tobe and I accompanied our riding companion and her Tennessee Walker back to her campsite at Rancho Oso. We were sitting chatting when suddenly she asked "What is THAT?" 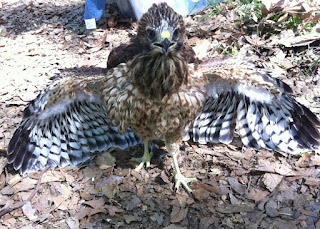 and pointed at a juvenile red shouldered hawk perched in a thicket of branches just across the trail. 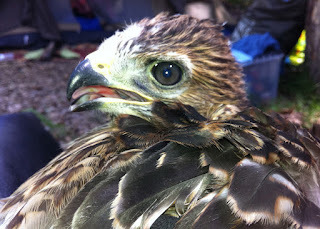 She'd been camping there all week, and knew there was a hawk nest above her tent. We determined that it must have fallen and not be fledged enough to fly. I shinnyed out on a fallen log, braved poison oak, and snagged the little guy. I first offered him a branch to bite, figuring better that than my gloved hand, but he was too weak to put up much of a protest and my training from working at the SB Zoo gave me the technique to nab him with little ruffling of feathers. I could have chosen to "let nature take its course" because hawks are known for continuing to feed and care for fallen chicks, but there were crows beleaguering the parent bird up above us, there were a hundred Boy and Girl Scouts coming to Rancho Oso for this weekend, and a bobcat prowls those campsite areas. I decided that I was meant to perform an intervention, and am very grateful that I knew there are wildlife pros who are so kind as to give the critter a second chance. who will know just what to do and are now on the job. When I worked at the Childs' Estate Zoo while at UCSB I helped with the oil slicked birds people would drop off there, and used the same kind of slow approach to nab this guy. The hardest part was balancing on the log in the poison oak and getting him back out of the underbrush without dropping or hurting him. Because he was so passive we think he was very dehydrated, and maybe I got there just in time. For those who wish I could have put him back in the nest, it was WAY high in a slick-trunked aspen about 40 feet up, and there were no forks in the tree he might have been placed in. And I was quite sure that if I could get at him on the brambles he was perched in a bobcat could too. I am quite aware of the rule of natural selection, and if he'd been out in any of the wild places I traveled through earlier in the day his time would have been up. But there he was, right in front of me, and I did what I could. It is ironic that he was a red-SHOULDERED hawk, since I thought he was a red-TAILED hawk who had no tail feathers yet to speak of. So, a random act of kindness rounded out my day, and out there in the harsh real world of the back country plenty of other baby birds will join the food chain and be someone's lunch without human intervention. This one's destiny was to present me with a challenge.